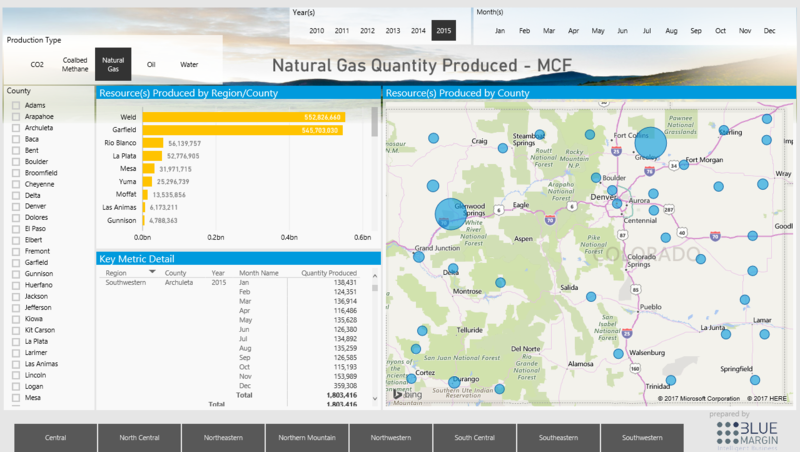 Blue Margin used data from the Colorado Oil & Gas Conservation Commission (COGCC) to help users gain better insight into the state’s oil and gas production levels. • What county has produced the most oil over the past 3 years, consistently? • What region had the least natural gas production in the past 4 years? • How much CO2 has been produced in Montezuma County since 2010? • Which region shows the greatest growth trend in water production? What’s the value of these insights? The state is making serious investments in natural-resource infrastructure and needs solid insight to determine how to most effectively spend their budget. Key decision makers need accurate, rather than speculative, answers to make sound investments. 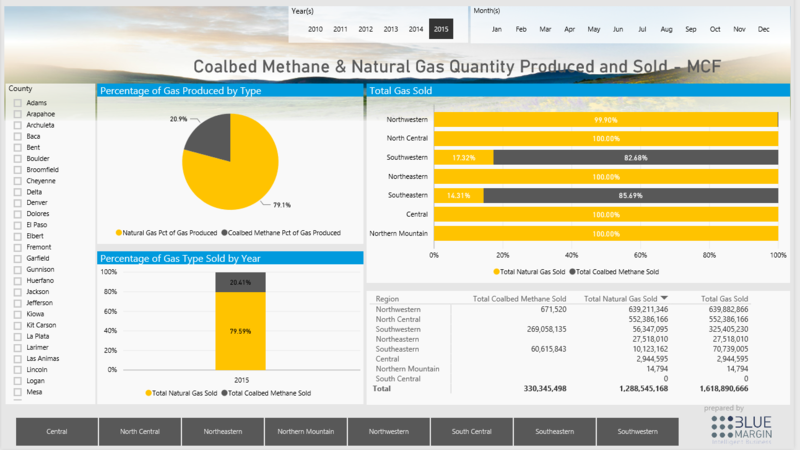 Using Power BI, Blue Margin took stale, tabular data, and transformed it into dynamic visualizations that allow users to discover insights, leading to better decisions regarding Colorado's investment in natural resources. • Determine total production and sales quantities, by county and resource type. 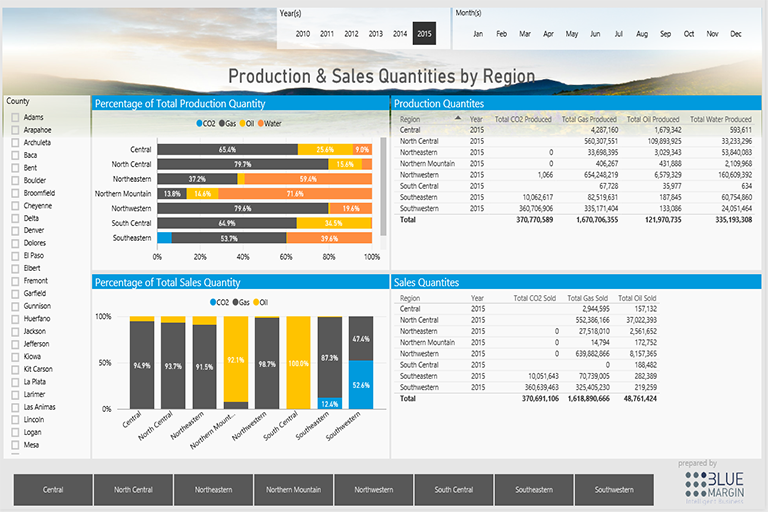 • See production levels and resources sold in an interactive map, by county and by year. • Make meaningful comparisons of natural gas versus oil production levels by county. • See total CO2 produced over the last 5 years by county.
. . . as well as many other insights. Using Power BI, Blue Margin transformed Colorado’s historical data into a strategic asset, empowering users in both the public and private sectors to make informed decisions about the state’s rich natural resources. 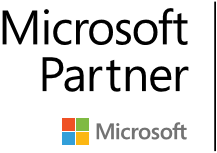 Gaining actionable, new insights from historical data is just one of the high-impact values of Power BI. Power BI brings data to life so users have the ability to answer questions more easily, make better forecasting decisions, see historical patterns and trends, and visualize activity by geographic location through interactive maps.